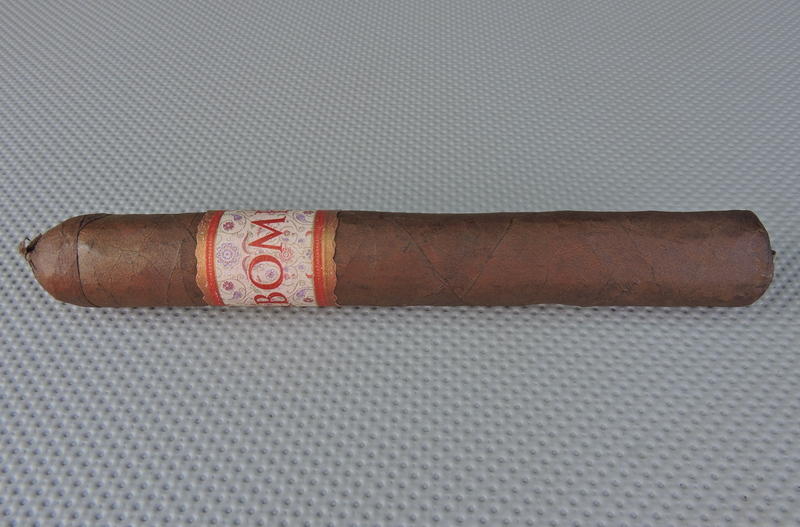 The MBombay Mora is one of five regular production lines currently offered by Bombay Tobak. The company is run by Mel Shah. Shah is a retailer who owns Fame Wine and Cigars in Palm Springs, California. After retiring from the IT industry in 2001, Shah opened his shop and now after more than a decade on the retail end, he has entered the manufacturing side. Shah produces his cigars out of Costa Rica. Recently I’ve had an opportunity to smoke the MBombay Mora in the No. 4 (Corona) format. Overall this cigar was nothing short of a home run and might rank among the company’s best work to date. 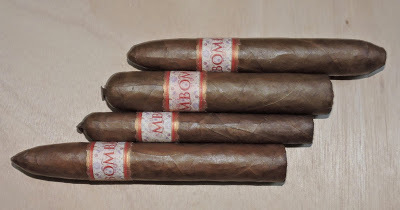 It was late in 2014 when MBombay introduced its MBombay Mora line. It was originally launched in three sizes: Robusto Largo, Toro, Lancero Several weeks ago, the company announced five new sizes: 585 , No. 2 (Torpedo); Salomon, “A” size, and a No. 4. One thing that was different is about these five line extensions is that they are packaging in cedar lined cans (the first three use traditional box packaging). While a guest on Episode 142 of Stogie Geeks, Shah explained that he believes can packaging is a better option because some of the flavor and aroma of cigars was lost with traditional boxes. Without further ado, let’s take a closer look at the MBombay Mora No. 4 and see what this cigar brings to the table. The MBombay Mora is highlighted by its Dominican Corojo wrapper. In addition, there is a Peruvian binder which is considered a staple in the MBombay portfolio. During the discussion on Stogie Geeks, Shah referred to the Peruvian tobacco as his “X Factor”. As mentioned the MBombay Mora is available in eight sizes. For the MBombay Mora No. 4, it is one of the five vitolas packaged in cans. There are twenty cigars per can for the No. 4. The Dominican Corojo wrapper of the MBombay Mora No. 4 has a rich dark mahogany color to it. The wrapper itself is on the oily side. There are some visible veins and visible wrapper seams. The No. 4 is finished with a small pig-tail on the cap and also has a covered footer. The band features the brand’s signature rose, red, and gold Indian-inspired mosaic design. There is red and gold trim across the top and bottom of the band. Prominently displayed on the band is the text “MBOMBAY” in large red font. As opposed to pulling off the pig-tail of the MBombay Mora No. 4, I opted for a straight cut to remove the entire cap. Once the cap was clipped, I moved on to the pre-light draw. The dry draw provided a mix of cedar sweet-spice, natural tobacco, and chocolate. Overall I considered the pre-light draw of the MBombay Mora No. 4 to be excellent. At this point I was ready to light up this cigar and see what the overall smoking experience could bring to the table. The MBombay Mora started out with a blast of pepper and cedar spices. As the spices settled down, notes of natural tobacco and sweet lemongrass emerged. The cedar and pepper notes receded into the background. Shortly afterwards a smooth chocolate note also surfaced in the background. Meanwhile, the black pepper was also prominent on the retro-hale. During the second third, the lemongrass dialed back slightly and the natural tobacco notes moved into the forefront. The cedar and pepper spices increased slightly becoming a close secondary note while the chocolate receded further back becoming more of a subtle note. By the last third the natural tobacco, cedar, and pepper notes were all in the forefront. The lemongrass notes were now more distant and the chocolate had dissipated. This is the way the cigar experience of the MBombay Mora No. 4 came to a close. The resulting nub was cool in temperature, but soft to the touch. Burn-wise the MBombay performed quite well. The burn took a straight path. The only possible negative was that the burn line did have some curvature to it. This was more cosmetic in nature and some touch-ups easily straightened things out. The amount of touch-ups needed was not excessive and this was a cigar that was never in danger of tunneling nor in canoeing. The resulting ash was a salt and pepper color. The ash was firm and came off the cigar in clean chunks. The burn rate and burn temperature were both ideal. The draw performed quite well. It wasn’t too loose, nor was it too tight. I categorized the draw as open and one that was low maintenance to derive flavors from. Overall I didn’t find the MBombay Mora No. 4 to be a nicotine bomb. I categorized this cigar as being on the upper end of medium strength for the duration of the cigar experience – falling just below medium to full. As for the body, when you factor in the retro-hale, I found that the Mora No. 4 qualified to be a full-bodied smoke. When it came to strength versus body, I found the body had a significant edge. While normally I don’t like a larger gap in intensity between strength and body, I found it worked rather well with the Mora No. 4’s flavor profile. In terms of the MBombay Mora blend, I have found it to be an excellent one. This is not a cookie cutter flavor profile in terms of what this Dominican Corojo blend delivers. I especially felt that the flavors came together near perfectly in this Corona format. There is a nice amount of flavor transitions and I found the construction to be excellent on each of the cigars I’ve smoked. 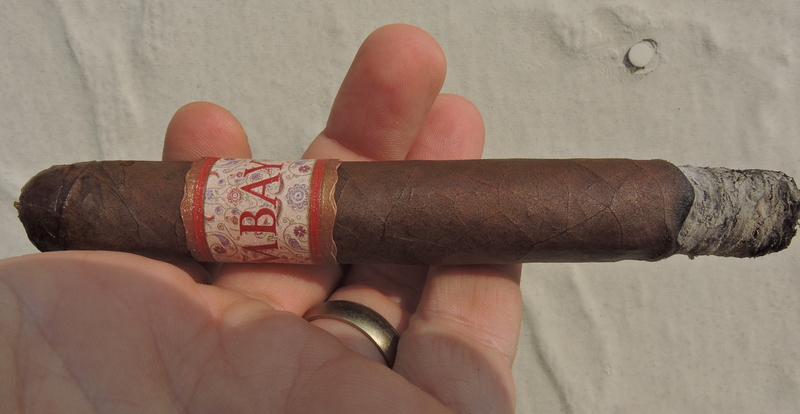 I rank this cigar as one of the more fuller-bodied cigars I’ve had from MBombay and because of that I think this is a cigar more geared for an experienced cigar enthusiast. At the same time, since it is not a power bomb in strength, I would not discourage a novice from trying this – especially if one wanted to “graduate” to something fuller in body. As for myself, this is easily a cigar I’d smoke again – and it’s one certainly worthy of picking up a can of these cigars.